Hi, when I saw this stamp in the new catalog I knew that I had to have it. (Its a steal at only $6.95 too!) 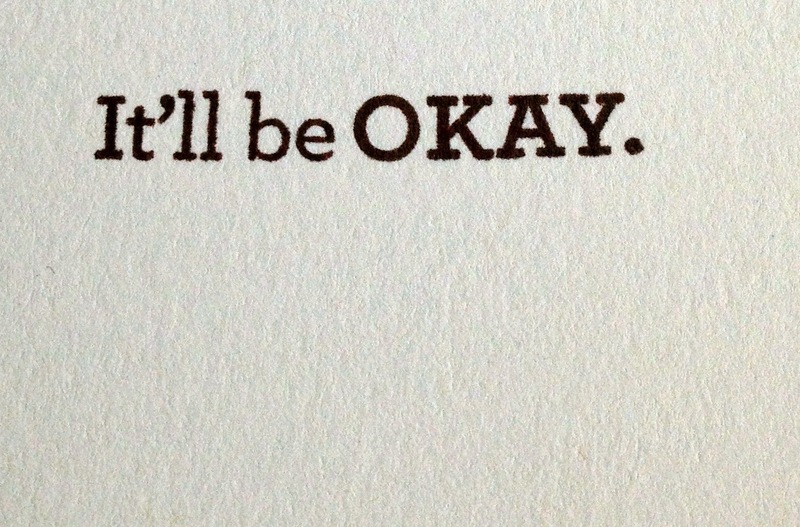 The stamp is called-- Keep your Chin up, with the saying "It'll be okay". However simple, this stamp resonated with me. Being a fighter, I can usually handle a lot. But, every once in a while I need a little help-- someone to say don't worry you can do or that it will be okay. These few words often provide the motivation to go on. With that being said, I made a few of these cards. I have a couple of friends that need a little reassurance. For them, hang in there and keep your chin up-- and remember it will be okay! Card sketch was based on a Deconstructed Sketch. The tree was heat embossed with Olive Embossing powder. 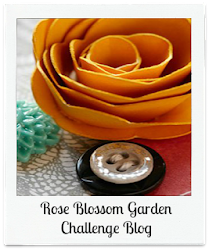 Hello and welcome to the CTMH SOTM Blog Hop. 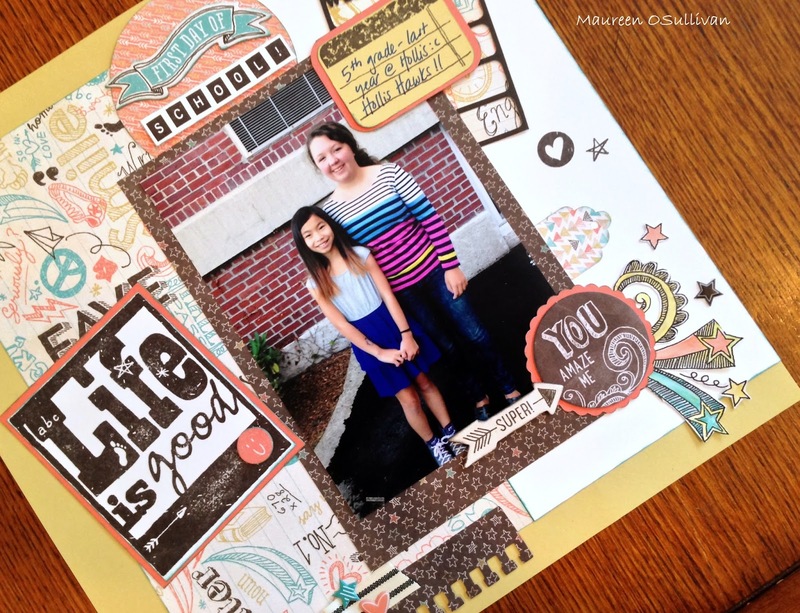 If you've come here from Melissa's Blog, then you are on the right path. 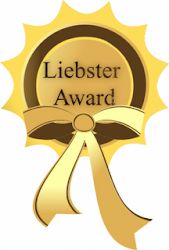 Should you get lost along the way, then click HERE for a list of participants. 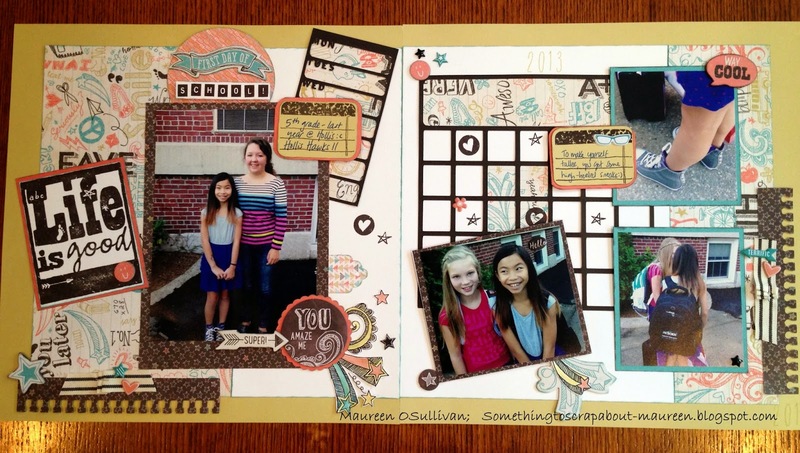 September's SOTM features a set of 7 images that are good for both scrapbooking and cardmaking. 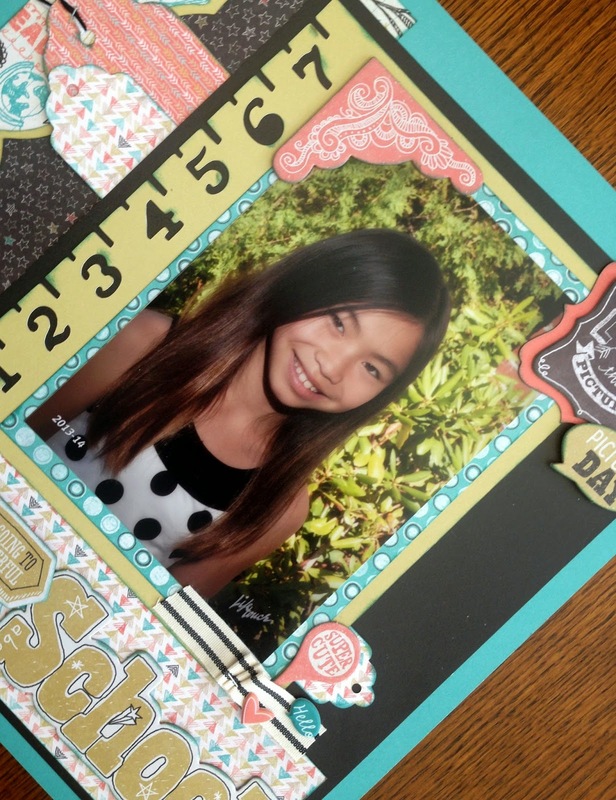 For this project, I chose to create a 1-page LO of my daughters. This pictures portrays the love my daughters have for each other. And what could be more perfect than the saying-- Family is Forever! 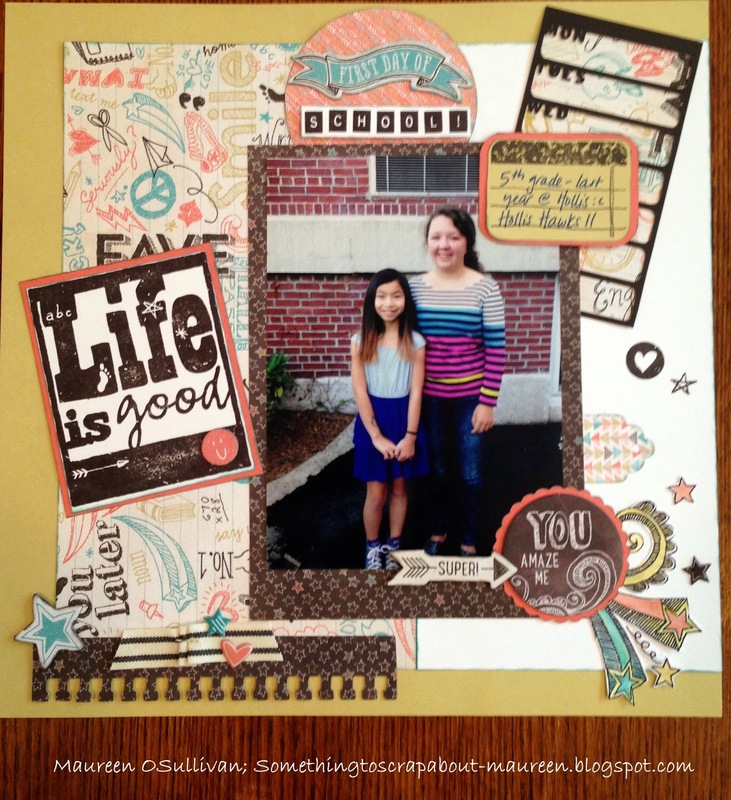 For this LO, I was inspired by the sketch on page 12 of the current catalog. For the Tree, I heat embossed it using Ranger's Silver Embossing Powder. 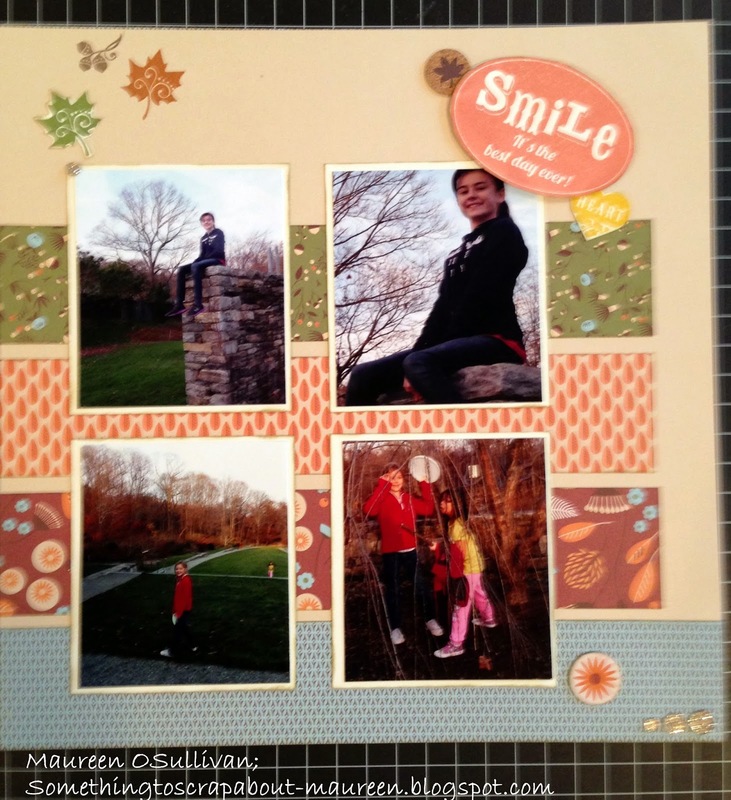 CTMH now carries 4 Ranger Embossing Powders-- see page 179 of the current catalog. Here's a close up of the picture. Maybe they'll remember this next time they are fighting!! If you love the SOTM and don't have a consultant, then please visit my Store. Other: Silver Embossing Powder (Z2067); Slate Striped Twist Ties (Z1864); Red Chevron Ribbon- discontinued, Slate Diagonal Ribbon (Z1989); and Metallic Twine (Z1921). Hi, a few of us did the Seaside WOTG in August. Fellow crafter, Jean MacLeod, deviated quite a bit, as did Alma. I love how Jean tilted the fish net and added a bunch of embellishments. 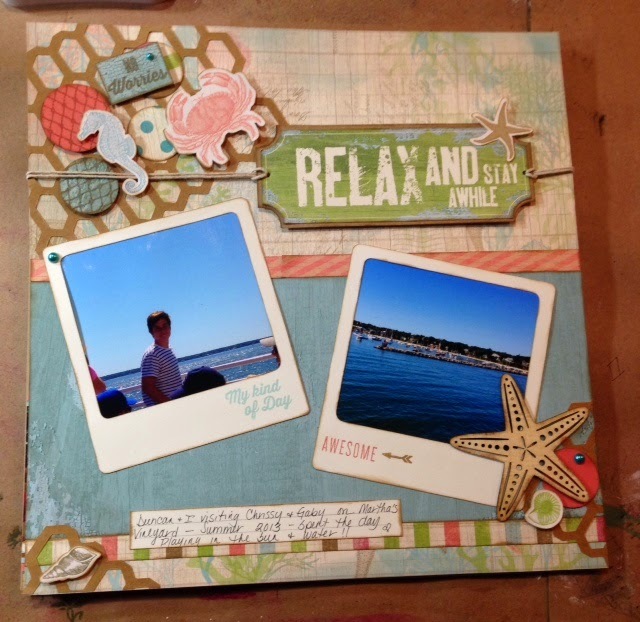 We also used the Seaside stickers and the Hello Summer (C1595) and Treasured Friendship (C1594) stamp sets. Jean based this LO on a sketch found on Pinterest. Stamps: Seaside WOTG (G1089); Treasured Friendship (C1594); Hello Summer (C1537). Hi, I had a couple of days off and just came back from Newport RI. After we unpacked, I headed to my craft room to finish up the second LO for Pathfinding Workshop On The Go (WOTG). Here is the first one. I pretty much followed the instructions for this one. I loved the design, embellishments and arrows, etc. 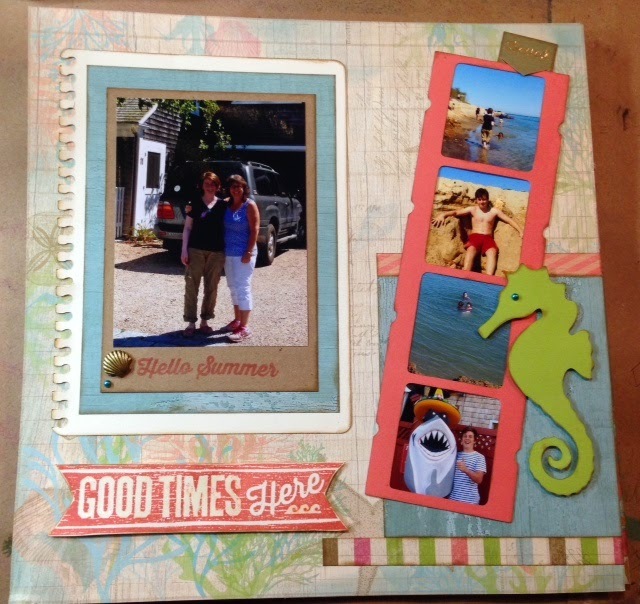 I modified it slightly to add a journalling box from CTMH's Artbooking Cricut cartridge. 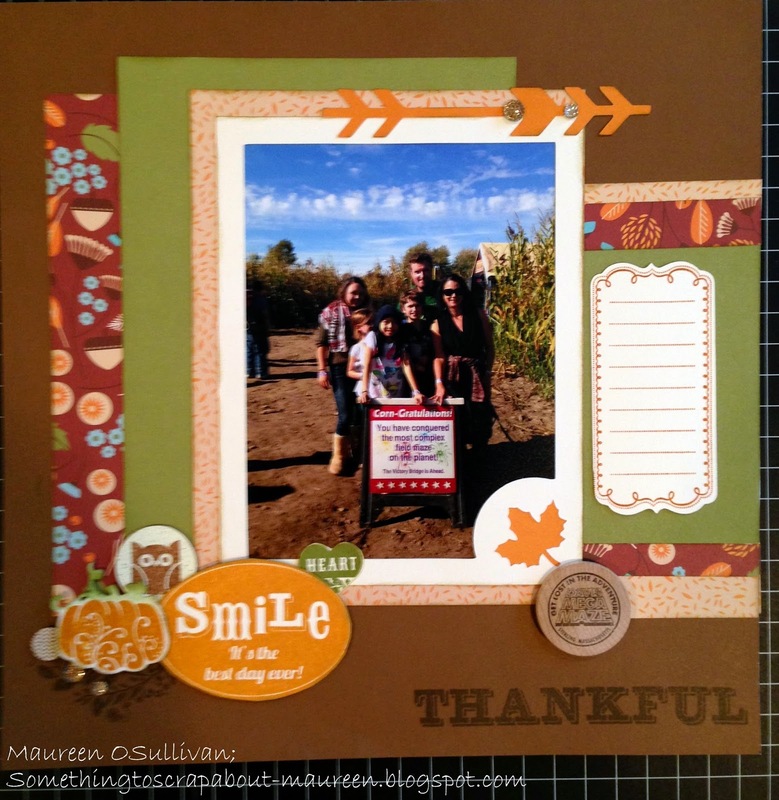 I also stamped the word thankful, which comes with the WOTG stamp set. I included a picture of my BIL on the right. After loosing both his brother and father to cancer in 2 years, my BIL was starting to accept the losses and enjoy life again. Above is the second LO. 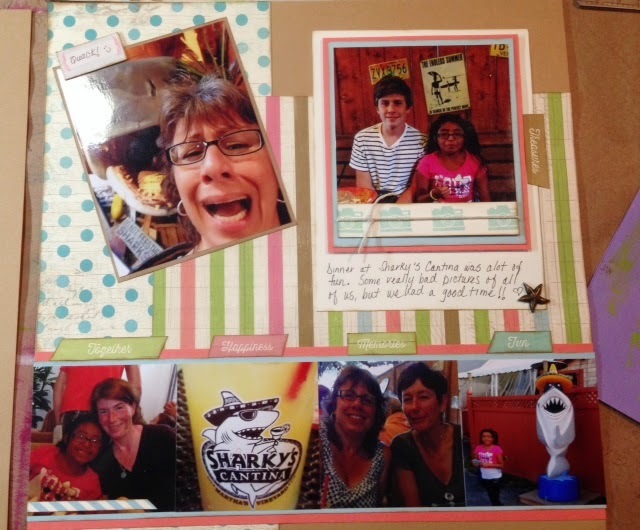 I changed it to accommodate two 4 X 6 photos and four 3.75 X 4.25. I decided to flip the pages also and add another strip of patterned paper. These pictures were taken from Boston's Arnold Arboretum. A man named Larz Anderson donated a collection of Bonsai trees to the Arboretum. Here's the other side. It documents are fun day at the arboretum. If you are interested in this workshop, then please join us on Saturday, September 20th in Norwell MA from 3-11 pm. If you can't make that date, then kits are available. The pricing is below and includes shipping/tax. Option 1: Pathfinding WOTG (G1082); $34.00 includes Stamp (size D), Pathfinding paper pack, Pathfinding Assortment, Bling Gold Assortment, extra card-stock and instructions. Option 2: Pathfinding-- Everything thing above, but no stamp; $28.00. Option 3: Pathfinding-- Everything in #1, but no stamp and only 1/2 pack of bling; $26.00. Hi back again! I started this LO a couple of weeks back and was able to finish it over the weekend. Here I used the WOTG instructions and made some minor changes because the CTMH design was awesome! First, you'll notice the black calendar frame and days of the week. These were cut using the CTMH's Artbooking Cricut cartridge. Once you cut and use these shapes, then you'll be using them again and again in other LO's. Also, those notebook edges were also cut with Artbooking-- so simple! The WOTG comes with a Life is Good stamp. This stamp is versatile and be used in other LO's. Here's the second page. I just love the calendar frame! 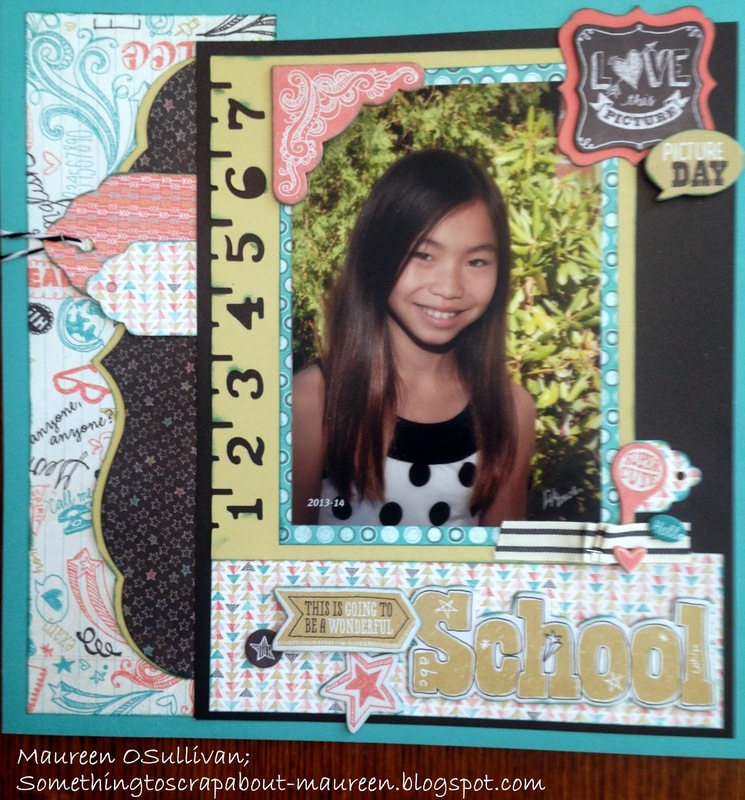 Just like the cards I recently posted, I took the twill ribbon and pleated it, then stapled it with CTMH's mini stapler. Here's another view. In the calendar frame, I just randomly stamped some images that came with the kit. 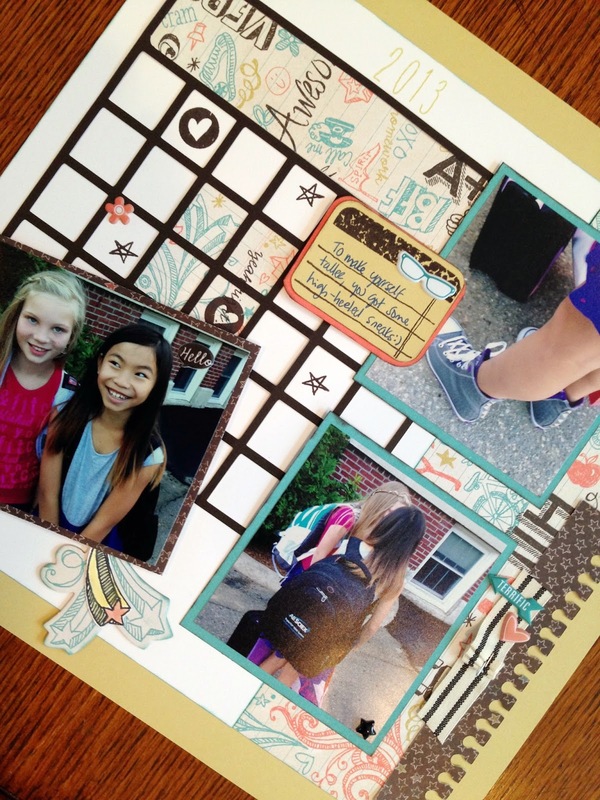 Look at that cut notebook journaling spot! With the WOTG, you can also create the LO below. I just have to add in a couple of extra pieces of cardstock. If you love these LOs and want to create them, then the best most cost effective option is to purchase the WOTG and Chipboard shapes. 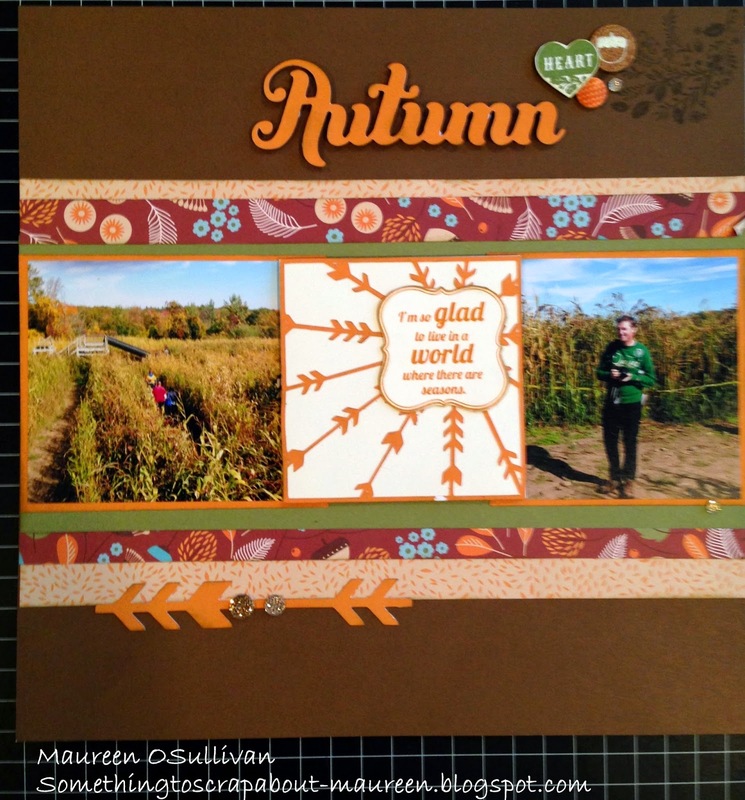 The WOTG incldes a full spool of Twill Ribbon and a pack or Assortment, along with a stamp set and full paper pack. If you just want to create the 2 LO's above and that is it, then just buy them. Hello, I made some cards over the weekend that I'd like to share. 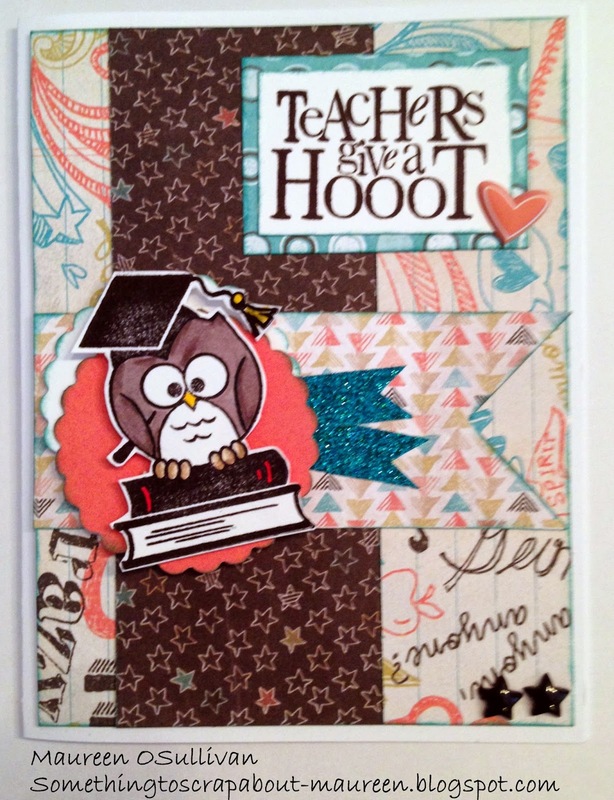 The cards were made using CTMH's new line called "Chalk It Up". The paper is very, fun with a bit of whimsy. 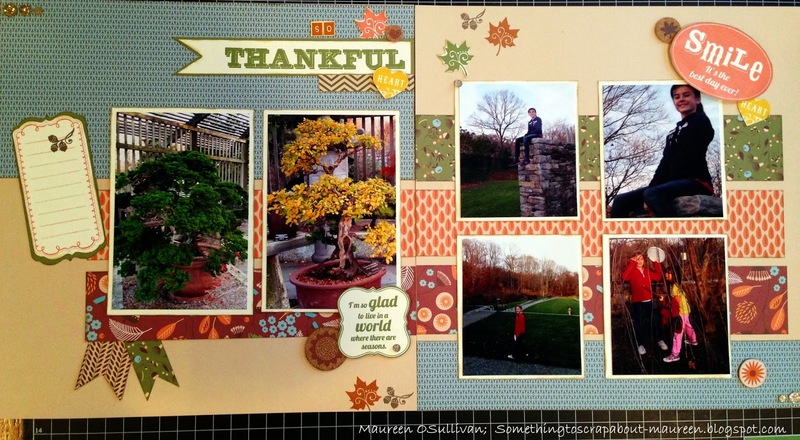 I will be teaching these cards at the Sept 20th Crop in Norwell MA. I'm hoping this will interest my card lovers. For the September crop, I'll also be making/teaching some Halloween cards. I know it will be Christmas before we know it! The first card reminds me of my 16 year old's doodling. 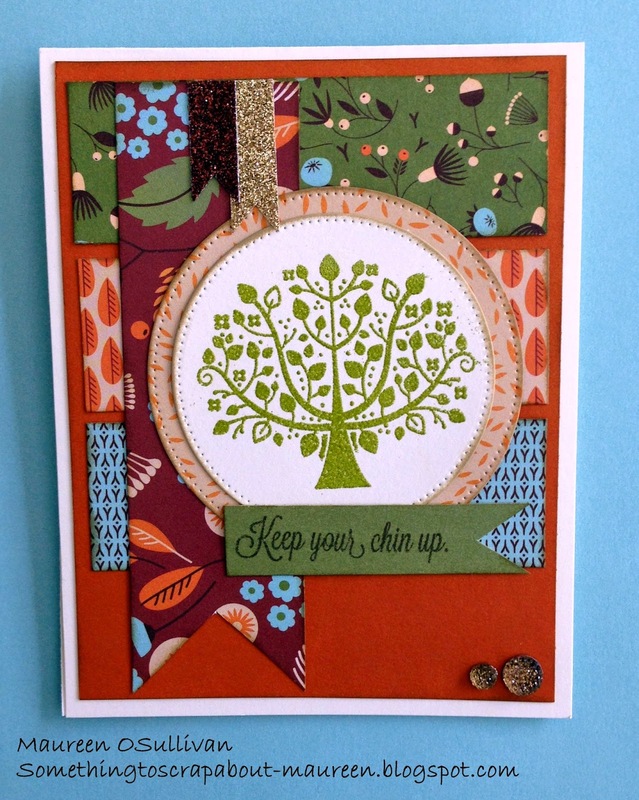 I plan to make a few more of these cards and change the sentiment to Happy B-Day. My daughter is always raiding my cards! 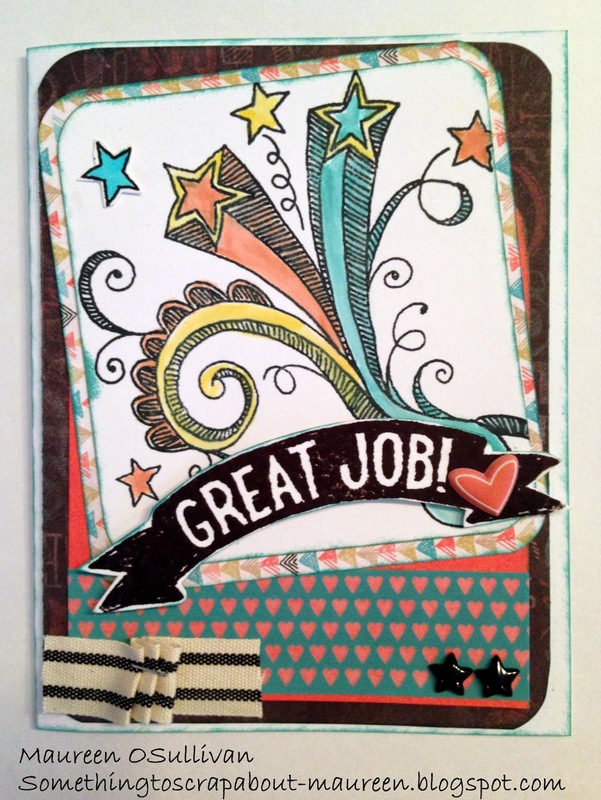 The stamp set is called "Great Job" and is $13.95, page 30. For the coloring, I stamped the image on the white cardstock. Then I used a blending pen and applied it to my ink pads. Colors: Sorbet, Lagoon and the new yellow color called Canary. 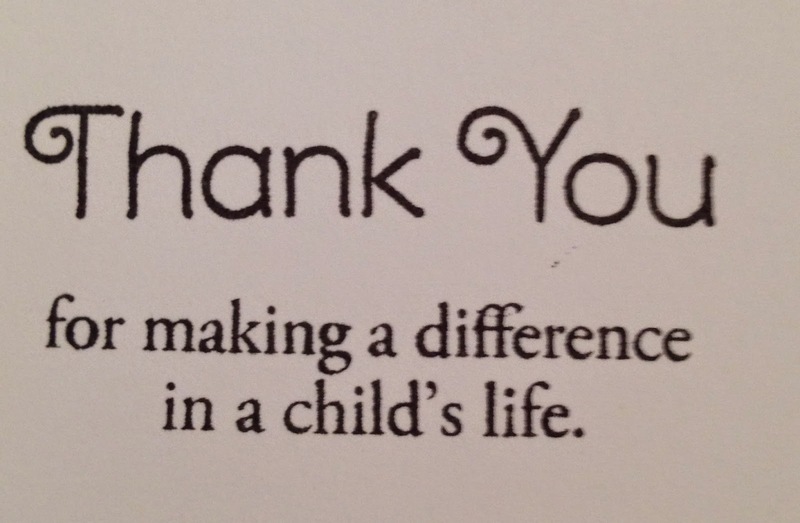 For this card, I used the "Teacher Appreciation" stamp set on page 37. There are lots of great images with this set-- check it out. For the coloring of the owl, I used CTMH's new ShinHan blending markers on page 180. So far, I'm enjoying these markers! 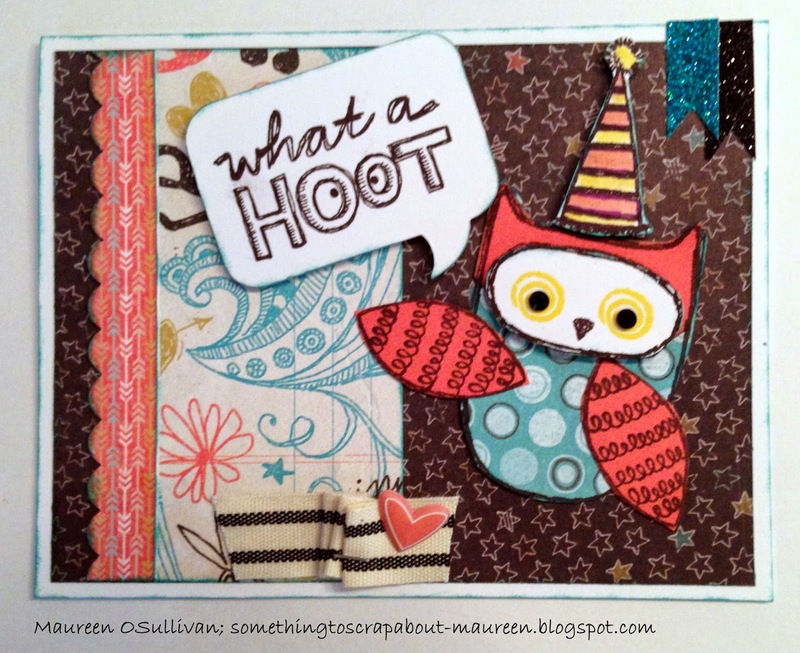 The last card used the August Stamp of the Month, "What a Hoot". This stamp set is stinking cute. It can be yours for only $5.00 if you place an order of $50 during the month of August. 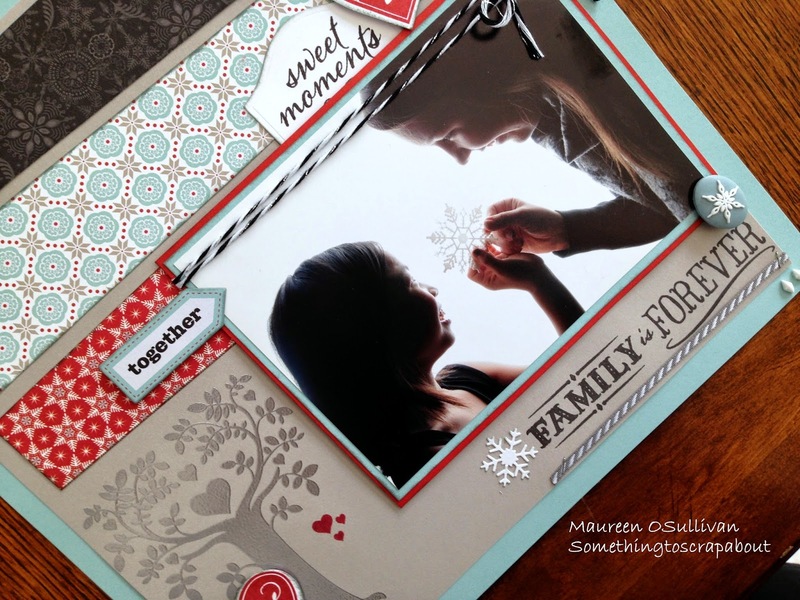 If you are interested in making these cards, please sign up or email me. 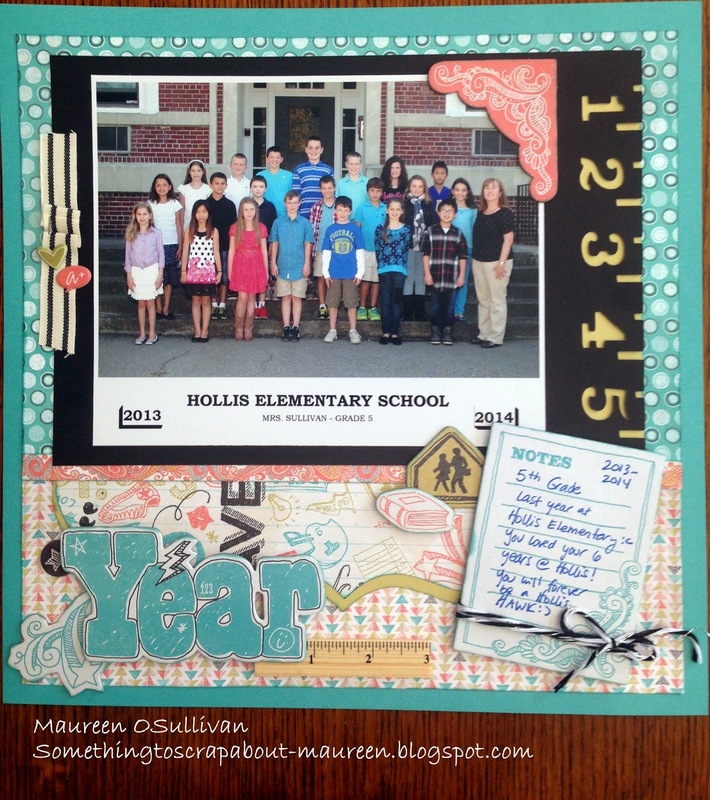 Stamps: Teacher Appreciation (D1612); Great Job (C1588), and August SOTM (S1408). Inks: Lagoon, Sorbet, And Canary-- New (Z2643). Other: Teal Shimmer Tape (Z1918); Black Striped Twill Ribbon (Z1988); Black & grey Bling (Z1754); Chalk it Up Assortment (Z3009); Lagoon Washi Tape (Z2004); and Blending Pen (3174). Hi, I've had these pictures since last Fall. When I saw CTMH's Chalk It Up line, I knew it would work. 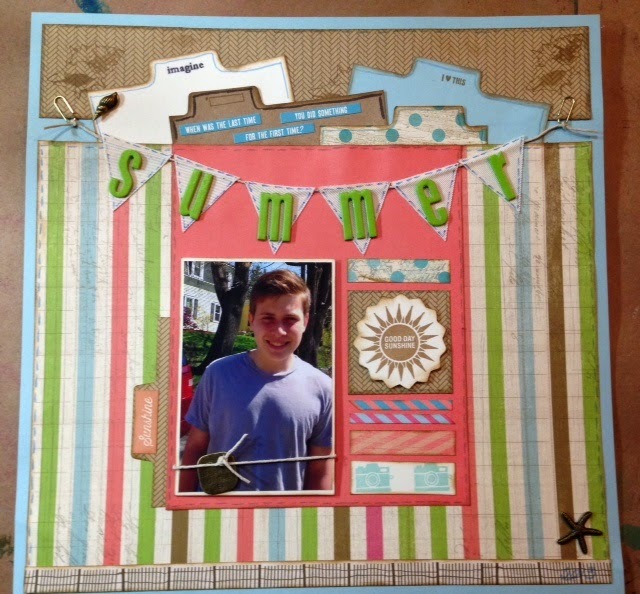 The colors are versatile and can be used for both boys and girls. 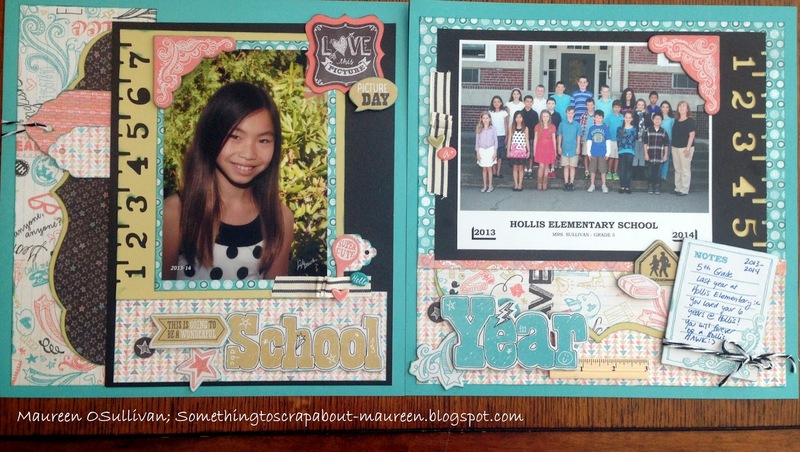 To create the LO below, I used CTMH Artbooking Cricut frames for the numbered frames. I cut one vertical and one horizontal-- very easy! 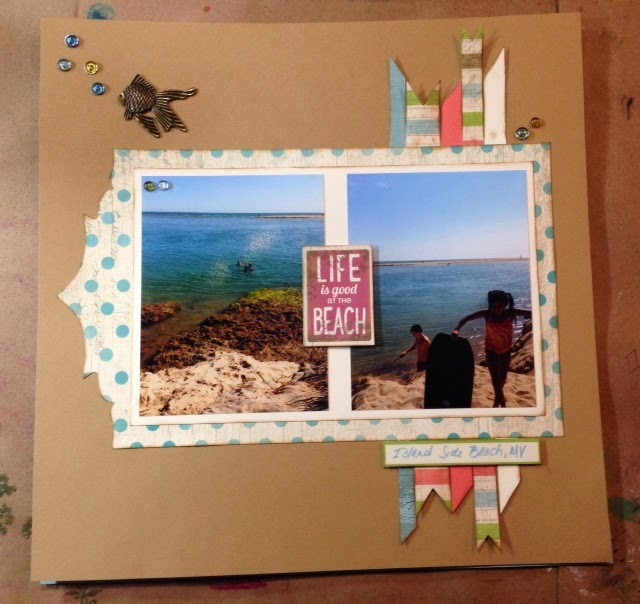 For the title, I used the coordinating "Chalk It Up" chipboard shapes. 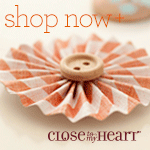 To make the ribbon pleat, I simply pleated it and then stapled it with our new CTMH mini stapler. I inked everything in Lagoon ink-- the same color as the base blue cardstock. If you want to make more with this paper line, then you can order the whole ensemble-- Paper pack, embellishments, etc. I will be making some additional LOs for this line. Please note that Option #1 below includes pieces of ribbon and other embellishments. 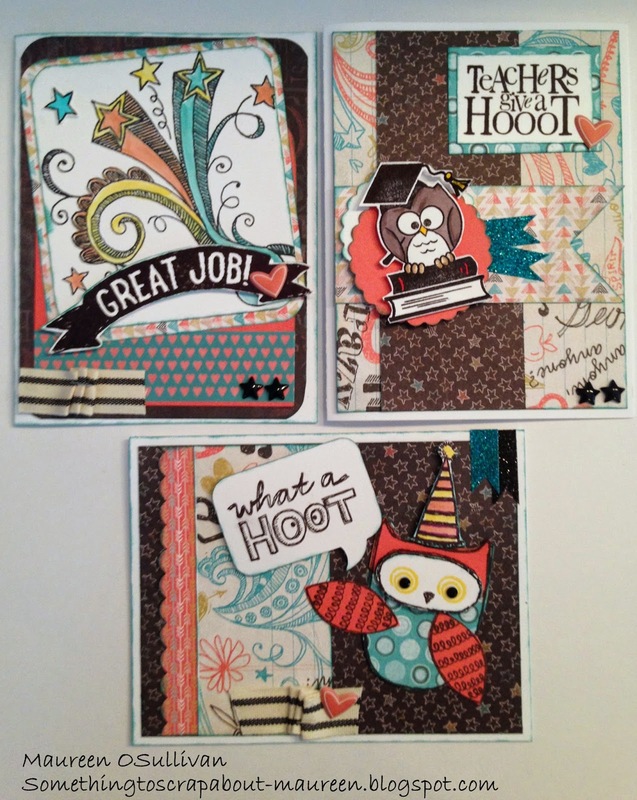 Option #2 is full packs of ribbon and Chalk it up Assortment (little embellishments). Option 3 includes everything in Option 1 & 2 plus Lagoon Ink. Thanks for stopping by! I hope you like these LOs, if so please leave a comment.